There is no over-riding plot or main character in Common Grounds. Instead, writer Troy Hickman presents a series of thirteen vignettes built around the titular chain of coffee shops. Founded by a retired superhero named Big Money, the goal of the chain was to give costumed crime-fighters a place to relax in their masked personas while they were off duty. In an effort to foster understanding and peace, costumed criminals are also welcomed provided they leave their grudges at the door. These interludes run the gamut from low comedy to high drama, occasionally playing with both comedic and dramatic elements at the same time. The opening story, “Beyond the Speed of Life,” sets this balanced tone perfectly. It tells the story of a reporter interviewing his favorite superhero, The Speeding Bullet, at a nearby Common Grounds location. The Speeding Bullet is a speedster who is widely beloved by the public and acknowledged as one of the greatest heroes in the world. He is also, to the surprise of the reporter, largely unsatisfied with his life outside of heroism. While he loves helping people and is thankful for the opportunities his powers give him, “SB” does express his wish for the ability to slow down on occasion and his desire to live a normal life. It would be easy to play the problems of a man with super-speed off for laughs or for Speeding Bullet to come off as a bit of a whiner, but Hickman seriously examines how super-speed with the heightened perceptions to match your reflexes would make everyday life a bit more difficult. For instance, being able to eat whatever you want due to a heightened metabolism that burns off excess calories in minutes sounds great in theory, but the fact of the matter is you have to spend more time in the bathroom than a normal person. Why? Well, there are some things you can’t do at super speed. Such is Hickman’s gift as a writer that he can play up the comedy such situations while simultaneously exploring the dramatic elements of the superhero genre. The book’s cast features a host of other such memorable characters, but my favorite is probably Moshe Chomsky. Moshe is a devout Hasidic Rabbi who somehow developed the power to melt anything he touches. Moshe is an honestly good person who prays for guidance and struggles to find constructive uses for a destructive ability, all while trying to tolerate “the smart-alecks in the media” who dubbed him “The Acidic Jew,” with good humor. There’s no small amount of irony that such a potentially deadly power should wind up in the hands of someone so ill-disposed toward violence and hurting people and it is fun to watch Hickman play off the clichés of comics (which demand that anyone with fire powers have a temper or anyone with cold powers be emotionally distant) in this way. This is one of the best-looking comics series I’ve ever had the pleasure of reading, featuring an all-star roster of artists. Dan Jurgens does the lion’s share of the work, having drawn six of the thirteen vignettes but there’s not a single scrub in the line-up. Michael Avon Oeming. Ethan Van Sciver. Chris Bachalo. Carlos Pacheco. Angel Medina. Sam Kieth. The legendary George Perez. You’d be hard pressed to get one artist of this caliber for a mini-series, let alone all of these fine artists! 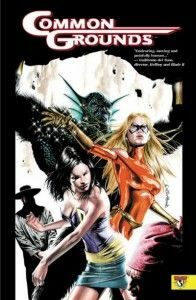 Common Grounds is a must read for any fan of the superhero genre, as well as those who typically dismiss superhero stories as childish fantasies. There are some truly complex stories here, with none of the gore or overt sexuality one usually expects in a Top Cow graphic novel. Indeed, apart from some frank discussions about superhero sexuality ala the Man of Steel/Woman of Kleenex debate, there’s no material in this collection I would consider objectionable for a teenage audience.